Cinema Rediscovered continues its celebration of one of the true legends of cinema - cinematographer Douglas Slocombe (1913 - 2016) - with a pair of films from his time at Ealing Studios. At the end of the Second World War, Slocombe found himself walking through the doors of Ealing Studios, a place where over the course of a few years he would hone his talents as a cinematographer while working on some of Ealing's most celebrated films. Here we present two of his perhaps lesser-known Ealing films: the black and white period drama The Loves of Joanna Godden (which was shot mainly on location in and around Romney Marsh, Kent) on Sun 29 July at 10:20 and the period Technicolor drama Saraband for Dead Lovers (which was shot entirely within a studio environment) on Sun 29 July at 15:10. 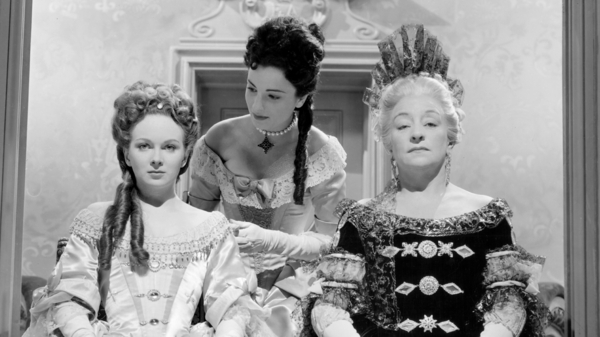 Ealing (and cinematographer Douglas Slocombe's) very first Technicolor feature film is a lavish costume drama set in the 1700s. For this third year of Cinema Rediscovered we celebrate two rarities in Douglas Slocombe’s filmography, from his early years at Ealing Studios. The films are worlds apart when it comes to style, and yet, were filmed within the course of a few months, co-director and co-curator of South West Silents, James Harrison, writes.